One of the common low-carb diet mistakes below might have derailed you. These mistakes are easy to make if you are not paying attention. 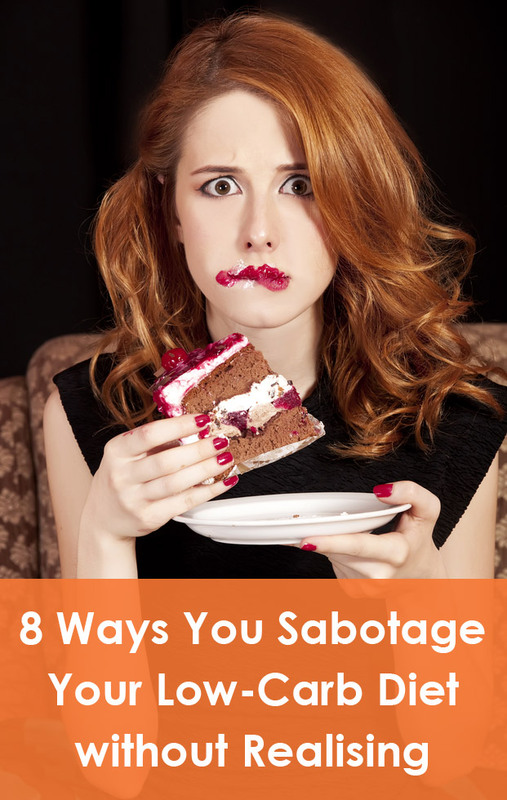 Any one of them can sabotage your diet and prevent weight loss. Be aware of these potential traps and avoid being stuck on a weight loss plateau. “If you are no longer hungry, stop eating”. This standard diet advice is even more important on low-carb. Low-carb, high-fat food tends to be high in calories. 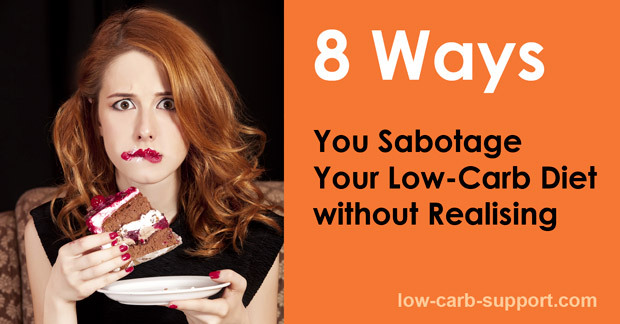 You do get metabolic advantages from eating low-carb. Food requires more energy to digest and doesn’t convert to body fat as easily as excess carbs. But eating too much is still eating too much. There is no way around it. Although low-carb diets suppress appetite, eating habits are hard to change. You might eat out of habit – same quantities or meal frequency – as you did before going low-carb. Pay attention to your body. Stop eating as soon as your hunger is satiated. Be extra vigilant with low-carb desserts. For example, it would be hard to eat two steaks in a row. But a steak followed by berries with a mountain of whipped cream piled on top? Easy. If you must have sweet-tasting treats, have them as a separate snack at a different time. Our bodies respond to weight loss by conserving energy. You might feel tired and drowsy. You probably want to spend all your time sitting down. Don’t. If you have no energy for exercise, just get up and walk. It doesn’t have to be fast or rigorous, just as long as you do something. If you like gadgets, consider investing in a fitness tracker band such as Fitbit. You can check your activity levels in real time and adjust your schedule if necessary. If you are not used to regular exercise, Fitbit’s “10,000 steps a day” target is a good place to start. If you already have an exercise regime, your performance might suffer in the beginning of your diet. Go easy and give yourself time to adjust. The important thing is not to stop. Once your body is used to running on fat instead of carbs, your performance will recover. Most standard sweet-tasting foods contain sugar (in form of sucrose, glucose or fructose) and are high in carbs. When you eat something sweet, your body expects a carbs hit to follow. Artificial sweeteners and sugar-free sweets can therefore confuse your body. It will expect carbs, but none will come through. This confusion can result in strong cravings for real sugar. Pre-packaged sugar-free sweets are often full of chemicals and preservatives, which can cause further unpleasant side effects. Sugar-free products can therefore contribute to a weight-loss plateau. If you’ve been indulging in them regularly, stop for several days and see if it makes a difference. Humans are notoriously bad at estimating nutritional values of food. We always err on the wrong side. If you rely on estimates, you are consuming more carbs and calories than you think you are. Don’t guess. Check nutritional info on packaged products, and look up carb counts for whole foods. You should replace the calories from carbs with fat, rather than protein. Otherwise you won’t get the full metabolic benefits of a low-carb diet. Most of us are fat-phobic, sometimes without realising. The media demonised dietary fat for decades, calling it the root of all health evil. Try to reverse this phobia and embrace fat. Make a conscious effort to add it to every meal. Try counting your fat intake for 1-2 days. You might be surprised at the results. It could be that you are getting less than you think. Low-carb dieters need to drink a lot of water. Staying hydrated helps your kidneys and liver to process the protein and fat you consume in the most efficient way. Another reason to keep drinking is that thirst can masquerade as hunger and sugar cravings. Don’t let it fool you! Drinking lots of water has one potential side effect – electrolytes (sodium, potassium, calcium) wash out of your body. Electrolyte deficiency can cause muscle crumps, headaches and dizziness. This is especially important in the summer or after exercise, when you lose more water through sweating. Consider taking a strong multimineral supplement to replenish electrolytes. One very simple step is to add more table salt to your food. Standard advice for ketogenic diets is to start at 20g of carbs a day. This level is low enough for most. However, some people have high metabolic resistance. They need to go even lower, to 13-15g a day. If you are not getting any results at 20g carbs a day, lower it a bit more. Do not go below 10g a day under any circumstances. If you have a very active lifestyle, you might need more carbs than that to keep basic energy levels up. Try 40-50g a day for a start, and adjust according to how you feel. Some alcoholic drinks are low in carbs, so technically, you can have them. However, alcohol can affect your weight loss in other detrimental ways. It converts to empty calories. It interferes with absorption of other nutrients, as your body will always process alcohol first. Alcohol can also mess with your hormonal balance and make weight loss harder. You might think that one small glass of wine every other day can’t do any harm. But in reality, this could be the factor causing your weight loss plateau. Try to cut it out completely. Low-carb diet is a great way to lose weight. Watch out for these simple mistakes and get the full benefits of this lifestyle. Pictures of people eating yummy desserts like on this web page create sabatoging cravings :(. But thanks for a great and helpful website anyway–wonderful, wonderful info! Sorry Annabelle 🙂 This was meant to illustrate the deep pit of despair caused by sugar addiction. I started a low-carb diet yesterday; first time in my life. This changes my eating habits completely. I don’t eat bacon, sausage, heavy creams, etc. All of sudden I’m going to shake up my lifestyle. While I understand the concept and hope to lose weight and regulate my sugar levels, I am so afraid I will gain weight. The concept freaks me out. How do I know for sure the carb/fat ratio is consistent with a healthy lifestyle but also lose weight? Once you know what to aim for, it’s a good idea to record and track all your food for at least several weeks, until you get used to it. There are many apps and online tools that let you do that. im about to go back on low carb for the 3rd time! Best of luck with your diet Angela! Please shout if you have any questions we could help you with.